The provision of an Anti-slip flooring solution is essential for any design project, whether, commercial or industrial. The reason? The safety of the end user. This is why, in the construction industry, standards define a specific degree of slip resistance based on the intended purpose of the flooring. All our commercial flooring products are available in Anti-Slip versions, with different degrees of slip resistance that can be adapted to the intended purposes and locations. Our Anti-slip flooring is subject to highly rigorous international standards. Each product must undergo a series of different tests, depending on the standards in place or the project requirements. 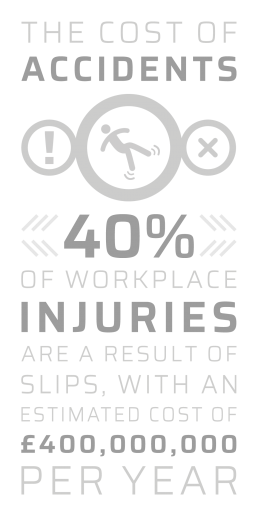 40% of workplace injuries are a result of slips, with an estimated cost of £400 million a year. Together with our manufacturing partners, we have spent years developing and innovating new Anti-Slip solutions with the aim of offering our customers products that ensure safety and comply with the relevant building regulations. However, slip resistance which ensures safety, must not harm the beauty, natural feel and the ‘easy to clean’ features of our floors. The technology used in production, has enabled us to offer products and materials that preserve the aesthetic qualities of the product, and guarantee full compliance with the necessary requirements. Please contact our Technical Dept. for further information 0131 564 0402.